The Książęce speciality collection has been expanded with Książęce Weizen. It is the sixth permanent variant in the family of beer specialities – extremely refreshing, served in a tall glass tapered at mid-height with a characteristic head of foam. Perfect for connoisseurs who highly value both taste and visual aspects of beer. After two premieres at the beginning of 2018, the second half of the year brought numerous victories for Książęce at beer competitions, and now the brand returns with another novelty. This time around, the brewers for Tyskie Browary Książęce searched for inspiration in ancient history. They went five centuries back to take a look behind our western boarder, to Bavaria, the cradle of wheat beers. - Weizen beer is an icon of that type, one of the most popular wheat beers. It is a great option for more demanding connoisseurs, who constitute the target group for the whole Książęce collection – says Ewelina Masiarz, responsible for the Książęce brand. – Wheat beers are the biggest speciality segment in Poland, a rich and diverse one, and simply had to include a premium beer from Kompania Piwowarska. Weizen was brewed with the use of wheat malt and barely Pilsen malt, with the addition of bitter and aroma hops. However, the hoppiness of the beer is very delicate, providing subtle bitterness. The beverage owes its fruity and herbal notes to a special strain of yeast. 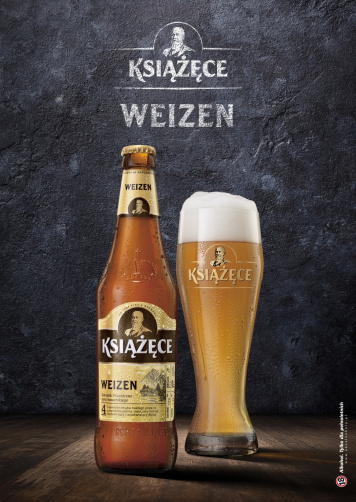 Książęce Weizen’s flavour is rich and distinctive, extremely refreshing, with a banana and clove aroma. Wheat malt is the key ingredient of both the new Książęce variant and Złote Pszeniczne, which has been a part of the collection from the very beginning. Despite that, the two beers are very different from each other. Książęce Złote Pszeniczne is a bottom-fermented wheat lager, while Książęce Weizen is a top-fermented Bavarian wheat beer, brewed in a lower temperature than lagers and with the use of other strains of yeast. - Weizen is a very distinctive beer in many aspects. It stands out with its cloudiness, typical for non-filtered wheat beers that are poured into bottles together with the residue of yeast, which provides the taste and opacity, deepens the bouquet and enriches the consistency – explains Ewelina Masiarz. –The residue inspires a special ritual when pouring Książęce Weizen into a glass – it should be done in a way that allows keeping as much of the residue as possible. After pouring most of the beer into a glass, the bottle should be swirled and then the rest poured onto the head. What’s equally important is the selection of glassware. A wheat beer glass should have a distinctive curve as it goes up, with even more curvature at the top to allow beer-lovers to appreciate the taste, smell, colour and foam. The latter is another distinctive feature of Weizen. In this type of beer, the head is very full and long-lasting, creating a characteristic head. Thanks to that, the beer not only looks spectacular, but also stays saturated and keeps its aroma for a longer time. Książęce Weizen is best served at the temperature of 5-6°C. It tastes great when accompanied by fish, seafood, smoked cheese and rich dishes from Polish cuisine. Just as the other permanent variants, it will be available in a 500ml bottle and KEG. The new variant in the Książęce collection will receive strong promotional support across many communications channels. At the end of January / beginning of February, POS materials will appear in stores and March will mark the launch of a TV and VOD campaign, social media activities and cooperation with opinion leaders.